Shrimp Scampi is a standard on all Italian restaurant menus. Scampi is shrimp, broiled in garlic butter in its simplest form, and we’ve made it this way dozens of times over the years. 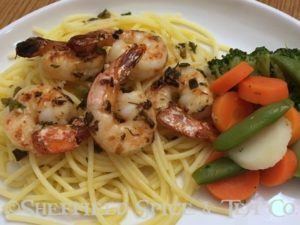 Our Shrimp Scampi Rustica version has a few extras, like Worcestershire Sauce and a bit of Cayenne Pepper added to the melted butter. The result is a savory butter for basting, which adds so much more flavor than just plain garlic. And as with escargot, the broiled butter can be poured in ramekins and soaked up with crusty bread. We like to serve our Scampi traditionally over a thin spaghetti noodle, which also goes well with the savory melted butter. We also will serve it with a side of long grain and wild rice. Give our version a try. We think you and your dinner guests will love it. If you need an easy Crusty Bread so you can make your own fresh, please click HERE for our recipe. 1 pound of Large or Jumbo Shrimp (about 20-24), shelled and deveined with the tails left on. Peel and devein the shrimp. We buy our already done, since it saves so much time. Leave the tails on. Preheat your oven broiler. Set your rack about 5 inches from the heat if you can adjust the distance. Melt the butter in a small sauce pan. Add the onions and garlic. Add the lemon juice, Worcestershire sauce, parsley, cayenne pepper abs optional wine. Stir to combine well. Place the shrimp on an oven-proof platter or broiling pan. Make sure the pan is large enough to spread them out a bit. Pour half of the melted butter mixture over the shrimp. Broil the shrimp about 3 to 4 minutes until the shrimp start to turn pink. Turn them over and pour the remainder of the butter mixture over the shrimp. Broil another 3 to 4 minutes until the shrimp ate opaque and they have started to get a but golden. Turn off the broiler and let the shrimp sit for a couple minutes in the butter mixture. Serve the shrimp over a small nest of spaghetti or wild rice, with a small ramekin of the broiled butter for dipping and to soak up with the crusty bread.